Japan Auction Agency is here for you helping you to buy on Japanese major auction sites Yahoo Japan Auctions, AS NET(Used/Damaged Cars), and Mobaoku. There are two payments "Service Fee" and "Shipping Fee." Simply, Service Fee is for goods purchases, and Shipping Fee is for delivery costs For further information, click the right-buttons. Japan Auction Agency is here for you helping you to buy on Japanese major auction sites, Yahoo Japan Auctions, and AS NET, Mobaoku...etc. Our service does not include making an inquiry to the seller or translating auction pages. Please check item condtions yourself before placing order to JAA. If you need to translate the auction site, please use the following web-translators. 1. Login to your member's page. 2. Click "Auction Service" order form. 3. Fill out the order form and submit it. If size, color, or other details are necessary to proceed a buy procedure, please enter details in "Remark" column on the order form. In order to avoid problems/troubles that harm your benefit, we may cancel orders due to seller's feedback, prohibited export or import, or other reasons. Our business hours are from 9:00am to 7:00pm in Japan Time. Orders placed outside hours will be processed next business day. After submitting your order, Paypal payment page is displayed. If you would like to know about payment more, please click the following button. If you do NOT complete a payment on PayPal, the order will be cancelled automatically. Our bid will start after the 1st payment (Service Fee) has been completed. 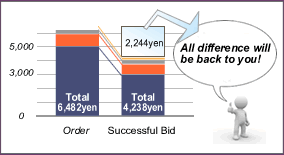 Bidding method is different from each auction site. Our bid to Yahoo auctions is placed at the last minutes of auction end as known as "Snipe Bid". Snipe bid is not available depending on the circumstances. You will NOT be able to cancell the order after our bid has been placed. If you add "Bid Now" option, we place a bid as soon as we confirmed your order. Bid Now option is ONLY available during our business hours. Successful Bid notification will be emailed. In case, successful bid price is cheaper than your stated bid price, all differences (Item Price, Commission, and PayPal Transaction Fee) will be refunded to your JAA Wallet. After successful bid, we make a buy procedure with the seller. It normally takes 3 to 7 business days for arriving your goods to our warehouse. Unsuccessful Bid notitication will be emailed.. The whole amount you paid will be returned to your JAA Wallet. Goods Arrival notication will be emailed. *We contact if the shipment from the seller is delayed (^o^)! We store your items until you send us a shipping request. *You can save a shipping cost if multiple items ship together. (This "Storage" option is at free-cost.) More information click here. We start shipping preparations as soon as your item has arrived. To deliver your items safely, we choose the best packing methods/materials for repacking. Shipping preparations start after goods arrival or receiving your shipping request (if you choose storage option). After completing shipping preparations, shipping invoice will be sent to you via PAYPAL. *If enough amount is in your JAA Wallet, a shipping fee will be subtracted from your JAA Wallet. Shipping preparation takes 1 to 3 business days normally. To protect from damage or breakage, packing material fee may/might be charged. If enough amount is in your JAA Wallet, a shipping fee will be substracted from your JAA Wallet. If insufficient funds occur, a shipping invoice via PayPal will be sent to your registered email address after a shipping preparation has completed. We do not ship packages Saturday, Sunday, and Japanese public holidays. Due to a custom clearance, weather, or other vairous circumstances, delivery may/might be delayed. If your package is stopped in customs, please feel free to email us. Please place your order at least 12 hours before the auction end in order for it to reach us during our business hours and to give us time to check your item. Please be aware that your request may be cancelled if we do not have enough time to check your item or complete a payment. JAA cannot deal with prohibited export. Click here to check further details. Some type of merchandises may be prohibited or restricted for import in your country. If you order the item which is prohibited import in your country, JAA will decline your order. Please thoroughly make sure the items you are about to order is NOT categorized into the prohibited import in your country. We recommend you to check with the customs for the most up to date information on prohibited imports. We do NOT accept any order cancellations once we placed a bid at the auction. We do NOT accept any goods return or exchang. - JAA/Seller mistakenly shipped a wrong item. We insure the goods for delivery inside Japan. If your items are damaged in a transit, we claim to the delivery company and compensate it on your behalf. We do NOT take any responsibility against lost, steal, or damage during the international delivery. We strongly recommend you to add the "Insurance" option when ording. The contents of the insurance follow each delivery companies. ©Japan auction agency. All rights reserved.